You are here: Home / Easter / Will you be the “Palmesel” on Sunday? 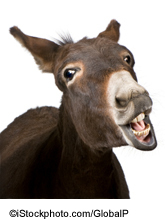 The Palmesel – literally the “palm donkey” – is a nickname given to the last person to get out of bed on Palm Sunday. The tradition is not new, but it has mutated over time as it was originally used to refer to the last boy to enter the Church on that day. Of course, the term refers to the donkey ridden by Christ into Jerusalem prior to his crucifixion, and since the middle ages German towns have held Palm Sunday processions – some with live donkeys, others with wooden ones. Why are there no lorries on the roads on Good Friday?